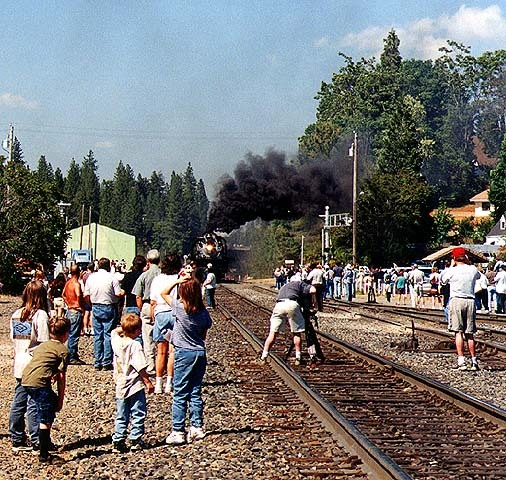 The weeks leading up to Railfair '99 in Sacramento were an incredible time for California railfans. 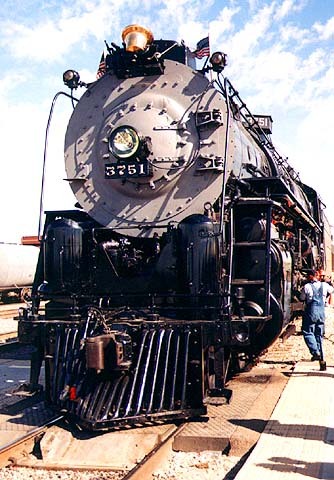 In some cases the preparations were almost more exciting than the event itself, as several well-known steam locomotives made their way to the state capital and the California State Railroad Museum extended its tracks in anticipation of the more than 40 pieces of rail equipment that would be on display. 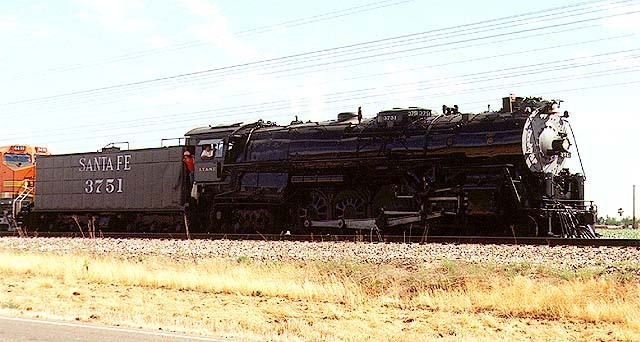 During May and June we were on hand for the arrival of the ATSF 3751, SP 4449, UP 844 and UP 3985, as well as a few others. The images on this page are dedicated to the activities that preceded Railfair '99. 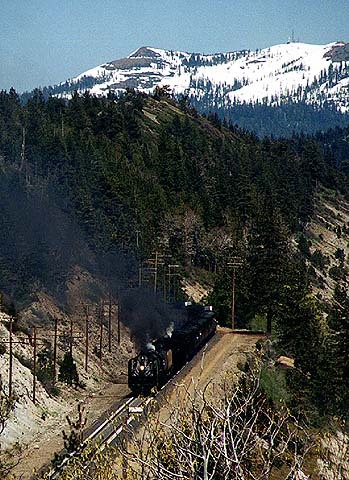 On May 21, 1999, a Union Pacific steam double-header crossed Donner Summit and descended into California, the earliest arrival for Railfair. 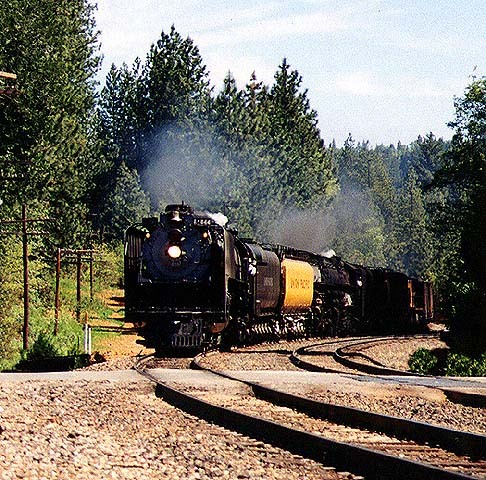 With UP 844 on the point and Challenger 3985 directly behind it, the consist powered its way past Emigrant Gap as dozens of onlookers watched. (We had most of them eliminated in Photoshop, but honest, there were dozens. Photo by Roni Gehlke. The train rounds the bend at Alta, heading west. (More onlookers eliminated in Photoshop.) Photo by Roni Gehlke. 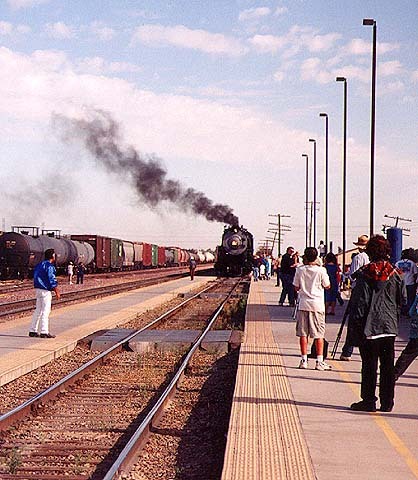 Colfax is a mob scene as the steam special rolls into town. We had barely enough time to park the car and grab a couple of quick photos before the train was on its way after a 15-minute stop. (And note: NO onlookers were sacrificed in the creation of this image!) Photo by Roni Gehlke. 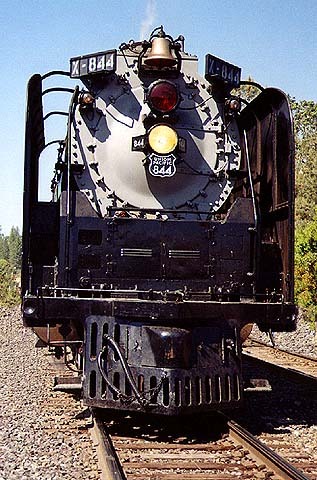 A head-on shot of the UP 844 shows some of the detail of this remarkable locomotive. Seconds after this shot, the train resumed its journey toward Roseville and a dedication ceremony for UP's new J.R. Davis Yard. Photo by Roni Gehlke. 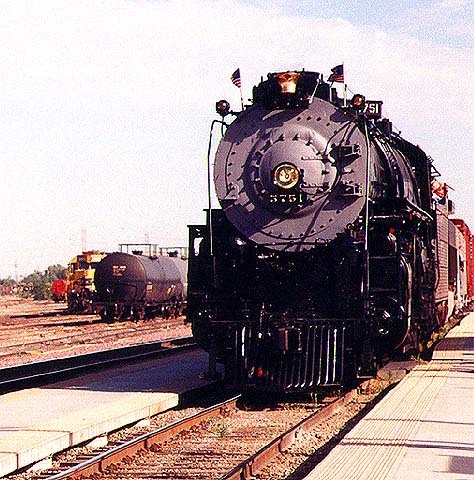 On June 15, 1999, Santa Fe 3751 made its way from Bakersfield to Stockton en route to the California State Railroad Museum. We drove as far south as Merced, then headed back north along county road J7 (also fittingly called Santa Fe Avenue) until we decided to wait in an almond orchard a few miles south of Denair. 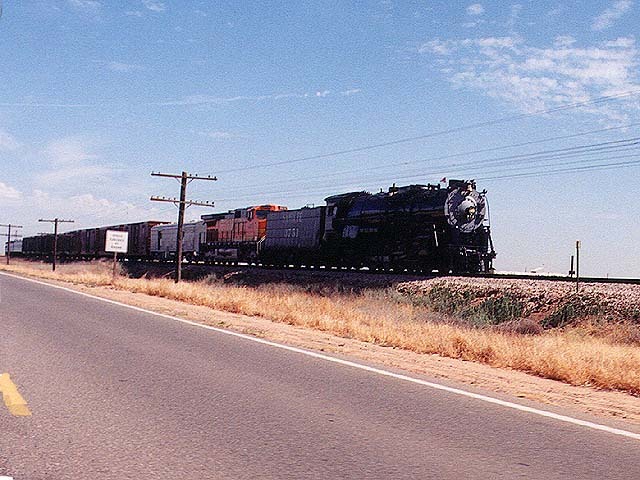 When we spotted the approaching steam special, we gave chase along the BNSF mainline. Here, we are a bit ahead of the train. Photo by Glenn Gehlke. At Denair, the special takes the siding for Amtrak Train 716, the eastbound San Joaquin. This allows about a dozen or so railfans who had been pacing the locomotive to pull off the side of the road and shoot film or video to their hearts' content. Photo by Roni Gehlke. After Denair, the train quickly got ahead of us. That allowed a moment to photograph some of the old-style cars amid the consist. 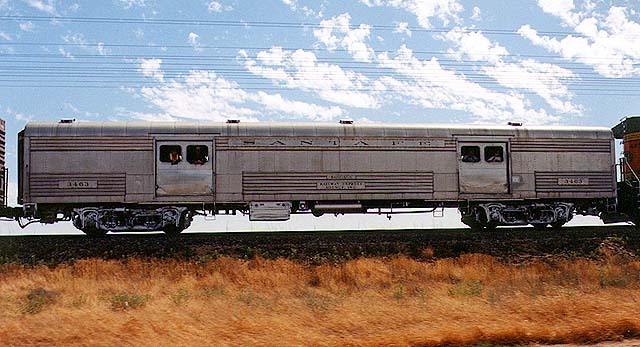 Here we have a Santa Fe Railway Express coach. Photo by Glenn Gehlke. When the train pulled into Riverbank yard about 90 minutes late, hundreds of people were there to greet it. Fortunately, the train lingered a long time at the depot as the crew lubricated the rods and bearings of the steamer and filled its tender with water. That allowed time to attempt photos such as this one, although shots like this were difficult to manage on account of the large crowd. Photo by Roni Gehlke. Another frontal shot of the 3751 in the siding at Riverbank. Photo by Roni Gehlke. Preparing to depart Riverbank, the 3751 sends up clouds of thick black smoke. With a characteristic chuff-chuff, the steamer rolls past a line of camera buffs and continues north. Photo by Roni Gehlke. 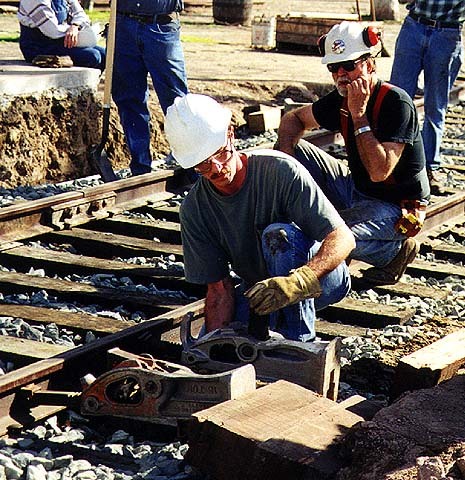 Months before Railfair was scheduled to open, crews at the California State Railroad Museum in Sacramento were making arrangements to accommodate the display of the equipment expected to be on hand. In mid-February we watched as a new section of track was laid and ballasted. 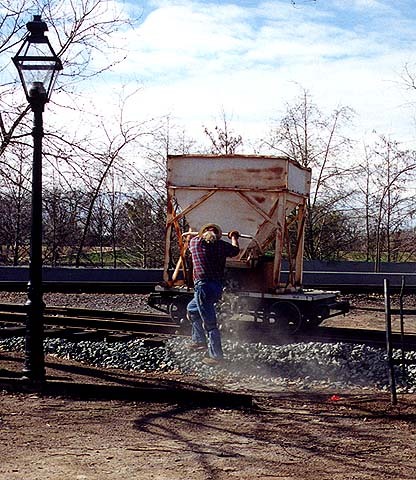 Here, a worker uses a small hopper to add rocks to the roadbed. Photo by Roni Gehlke. A worker uses portable jacks and blocks of wood to keep the track in gauge before it is spiked into place. The ties will later be hidden under pavement. Photo by Roni Gehlke. 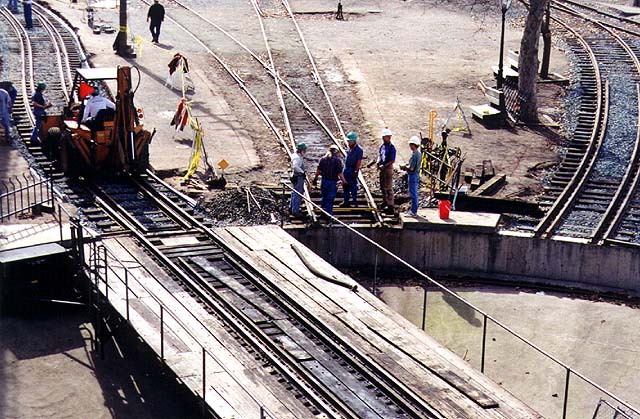 A view from above the museum's turntable reveals the extent of the project. The track to the left is brand new, as is the dual gauge capability of the other tracks. Photos by Roni Gehlke. This page was last updated Tuesday, June 22, 1999 at 10:25 hrs.